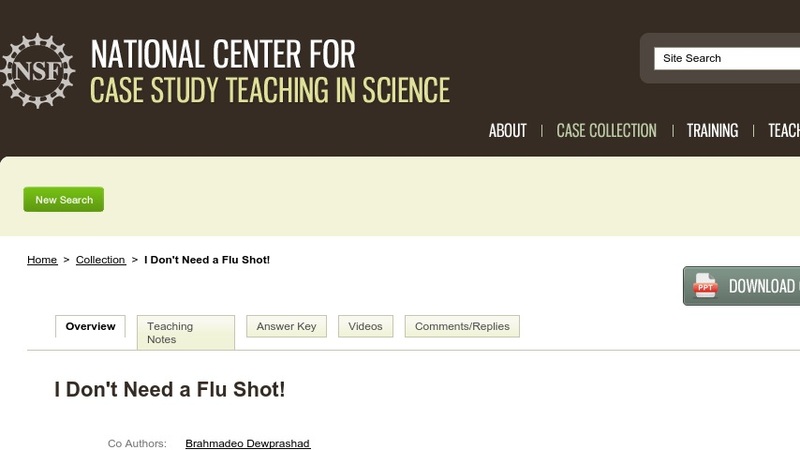 In this “clicker case,” Ryan, a college student, receives an email from the campus health education office urging students to get a flu shot. Ryan thinks it is too late since he just had the stomach flu, and besides, even if he did catch it, he would just take antibiotics. Fortunately, his girlfriend Ashley is able to correct these and other commonly held misconceptions. In learning about the dangers of flu and how to prevent becoming sick, students also learn about viral mutations (antigenic drift) and viral recombination (genetic shift). The case was written for a large introductory biology course for both science majors and non-majors that makes use of personal response systems (“clickers”). In class, the instructor presents the case using a PowerPoint presentation (~1.6 MB) punctuated by multiple choice questions that students answer with their clickers. The case could be adapted for use without these technologies.